Most southern Michigan sightings were young bears pushed out of their territory. Photo: Wikimedia Commons. Maybe you remember the news reports: “Michigan black bears are moving south.” A spate of sightings just a few years ago confirmed that bears were showing up in unusual locales, such as Flint, Battle Creek, St. Charles and Lansing. State biologists thought a population might have established itself just north of Grand Rapids. And, if it was true that black bears were moving south, state wildlife managers wanted to educate southern Michigan citizens about living peacefully with bears in the neighborhood. Well, that was then. Dwayne Etter now believes bears are not moving south to establish self-sustaining breeding populations in southern Michigan. He is the Michigan DNR wildlife researcher who collared and tracked 18 of the more southerly bears, beginning in 2010. Each bear was found in a winter den and fitted with a GPS collar that transmitted its location every half-hour. The data points, when plotted on a map, showed Etter where each bear traveled — which river corridors they navigated; what routes they took through a forest; whether they crossed farmers’ fields or went the long way around them. Etter said most of the bears were young males and females that got pushed out of their northern range. They headed south and eventually denned up for the winter. Females that had bred went about having their litters. Young males headed back north in spring to find a mate. 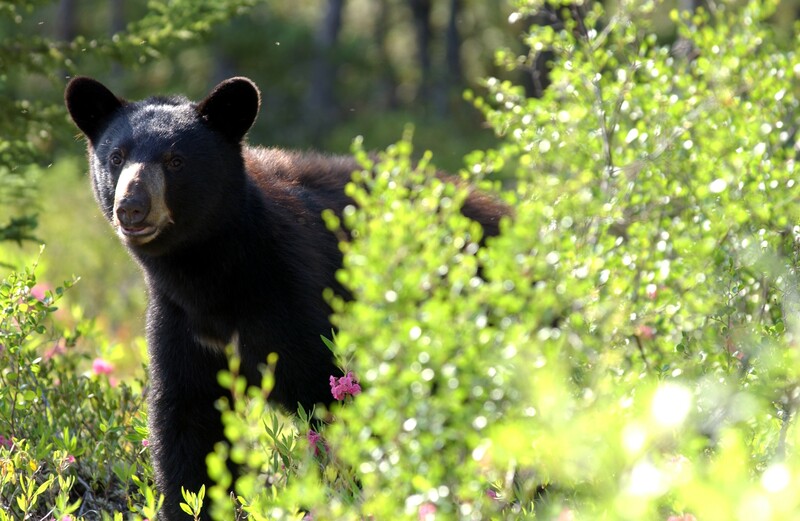 Etter’s findings showed several surprises, including how far black bears will travel. One nuisance bear, collared near Whitehall, traveled as far as Houghton Lake. It wandered up the White River corridor in spring, eventually crossed the Muskegon River and established a home range just south of Houghton Lake — approximately 125 miles from its den. Another male traveled 75 to 100 miles from Breckenridge, a Gratiot County village southwest of Midland, to Alpena County, where it spent a couple of weeks before moving 50 miles south to Gladwin County. Once there, he was killed by a hunter. Etter was surprised to learn that bears all use the same travel corridors, the same routes through brush, swamps and forests. The GPS data, literally thousands of points on the map for each bear, also showed where they stopped — and sometimes spent weeks. Etter visited one of those spots and found the ground littered with acorns and beechnuts. Bear behavior in farm country came as a big surprise. Bears largely avoided agricultural areas. Etter suspected bears would use corn and bean fields for food and cover. But the GPS data showed otherwise. I have wondered just how southern Michigan residents would cope with having black bears in their backyard. Northern Michigan residents have learned to deal with it. But, truth be told, not all are happy. Many complaints over the years have come from southern Michigan residents who built second homes in bear country. They were unprepared for the reality that bears do what bears will do. Etter’s study has shed some light on bear travels in southern Michigan. Fortunately, for those more concerned about sharing space with the beasts, it is something they need not worry about. This entry was posted in Uncategorized and tagged Bears, Black Bear, Conservation, DNR, Environment, Michigan Department of Natural Resources, Nature, Wildlife. Bookmark the permalink.